Photo by Danka & Peter via Magdeline. In 2014, I experienced a personal crisis that rocked my world. When the time is right I may share that story here, but for now, I want to share something that really helped me navigate this period with relative ease – and that is the concept of ‘The Heroic Journey’. An archetypal map of the human experience through crisis, despair and renewal. The heroic journey was coined by philosopher and mythologist, Joseph Campbell who developed it as a common map of experience that hero(ines) go through in countless mythologies, across cultures, throughout time. It’s a journey that entails a separation, initiation and return, from the ‘known’ into the ‘unknown’ and back again. The general pattern is thus: the hero(ine) ‘answers the call’, fights to slay dragons for survival and returns a renewed individual. Think Star Wars or Lord of the Rings with Luke Skywalker and Frodo playing the hero. It’s a map that is repeated across countless fairytales, myths and stories. In everyday life, YOU are the hero(ine) of your journey and when it comes to personal growth and development, your trials are often of a emotional/psychological/spiritual dimension. The content of the journey may be vastly different, but the pattern is the same. When you understand the pattern of the heroic journey, all of a sudden the ups and downs of life can be placed into context. We have a map that tells us where we are on the journey and most importantly, where we are going. 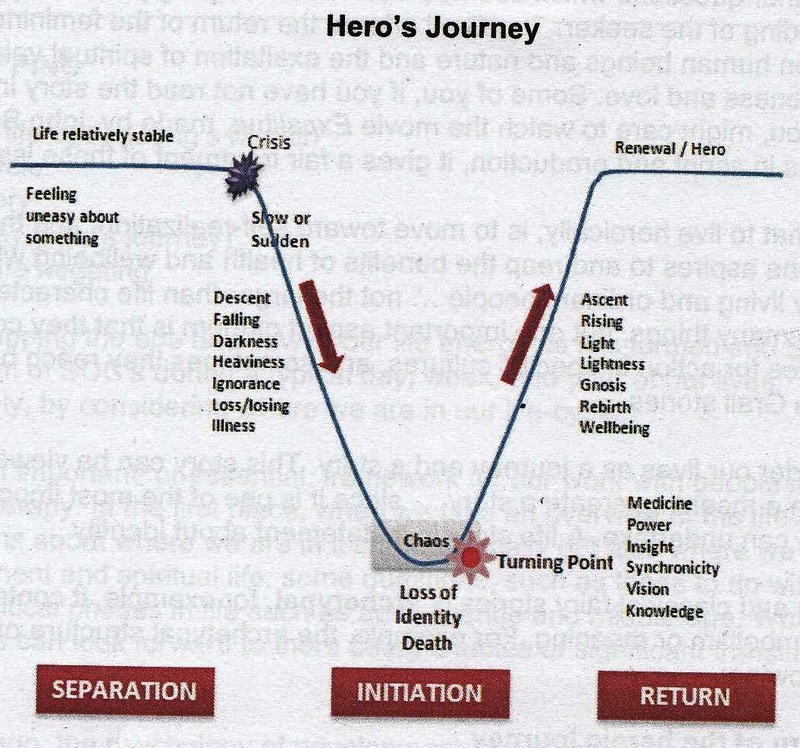 The Heroic Journey Map – Courtesy of College of Complementary Medicine, Sydney. It all starts with a call to action or ‘crisis’. Something happens to us or in our world that shatters our settled version of peaceful reality. The crisis is such that we can not continue to live our life in the same way we have before. A separation occurs. Everything changes. A ‘crisis’ can be a range of different circumstances, such as the death of a loved one, a break-up, loosing a job, bankruptcy, miscarriage or illness. It can also be a falling out with a friend, moving house, cities or countries or starting a new business or career. What constitutes a ‘crisis’ may be very different for each individual, yet equally as jolting. What follows a crisis is a collapse of our sense of reality and consequently a descent into challenge and chaos. 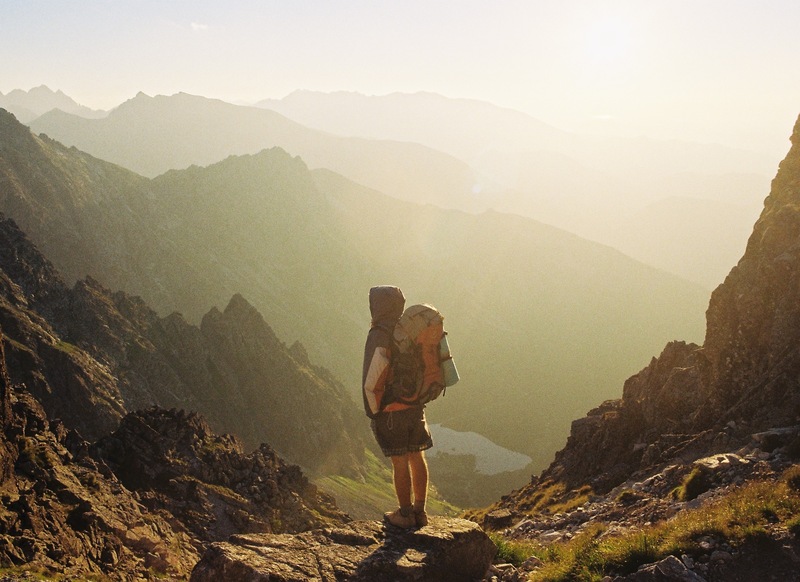 This descent can be slow or sudden, but either way there is a loss experienced, a falling into unknown territory, a series events and survival mechanisms that contribute to your descent. Mythologically speaking, this is the part of the journey where the hero or heroine faces challenges and temptations on their heroic quest. The nadir or abyss is the darkest it gets. It’s the final ordeal we undergo. The place of death and rebirth. Our lowest point. As scary and dark as it sounds, it’s also the place that precedes our ultimate transformation. It’s necessary to enter into this place of darkness, but absolutely not necessary to stay there! Surrender to the depths, find your gold and then keep moving! The process of passing through the Nadir, can be likened to the transformation point between yin and yang. When yin reaches it’s darkest depths, it is suddenly transformed into yang. It’s this transformation of dark to light that is a metaphor for the turning point that always comes when we are brave enough to completely surrender. It’s this inner revelation that gives us the spark to move forward. In myth and story, the nadir is the place where the hero or heroine almost looses everything, but escapes with the treasure at the very last moment, emerging victorious. The return journey as the renewed individual. It’s here we discover our ‘medicine’ that special new quality that is powerful enough to carry us forward as a renewed individual. This is also the process of integration and when integrating a new aspect of our being, the hero(ine) always undergoes a series of tests. Returning to a world that still relates to us as the person we used to be is bound to challenge our new-found sense of self. It’s on the return journey that our transformation is solidified. It becomes a rock-solid part of who we now are. And we return to life renewed. 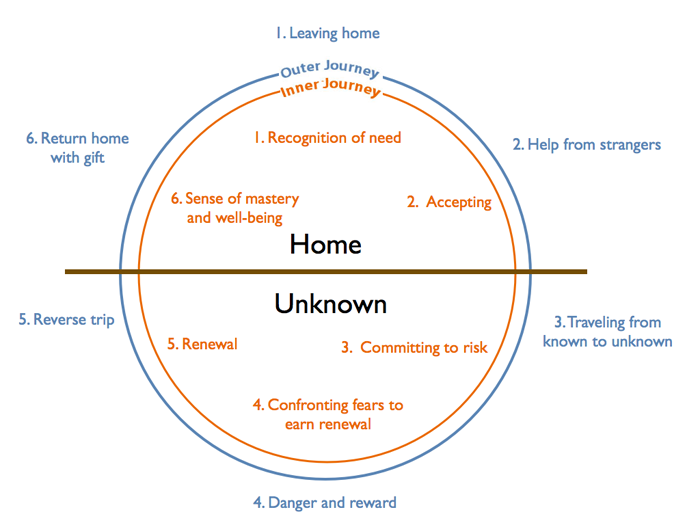 At any stage of life, wherever you are on your path to wholeness, the heroes journey can serve as a valuable map to your experience. Experienced a ‘crisis’ recently? Know that the heroic journey, if entered into with consciousness, will deliver new learnings and new ways of being that will see you emerge transformed. As much as it may be difficult, look for the opportunities for growth and allow yourself to surrender to the experience. In the darkest of despair? Know that the map of the heroic journey promises deep transformation and a return to life that will be forever enriched by your experience. This is a tender place to be in – get help if you need it. Coming out into the light a new and transformed individual? Still in a process of integration? Consider the journey you have just been on. Look back with gratitude on your experience. Acknowledge yourself for coming through a difficult circumstance and for doing the work necessary for your growth. You are the heroine of your own life. The map of The Heroic Journey is truly a celebration of death and rebirth. Of change and growth and the resilience of the human spirit. If there were no trials and tribulations, then we simply wouldn’t value life in the same way. It’s the treasures we collect in our darkest, most challenging moments that enrich our lives beyond measure, bringing us closer to ourSelves. To sign off, I’ll let Jason Silva deliver his inspirational take. Negotiating your own heroic journey? Transpersonal Counselling can really help. Click here to find out more.